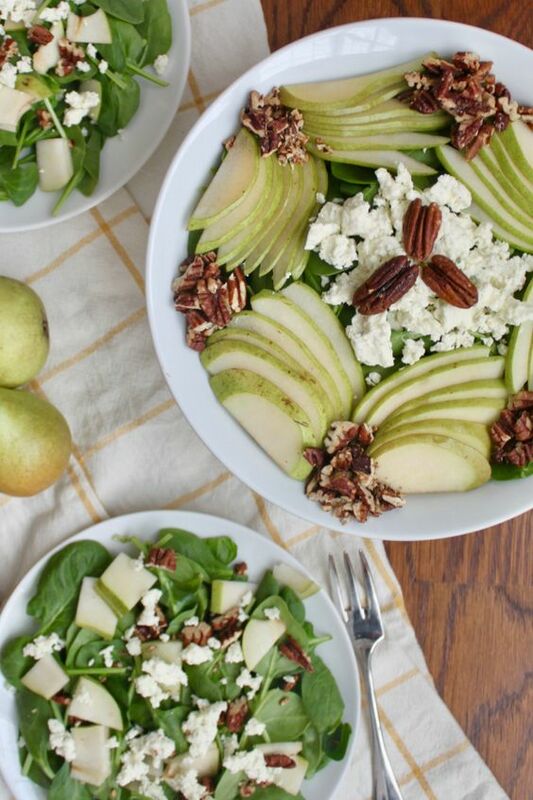 This spinach salad with pears and candied pecans is my go-to, weeknight fall salad. 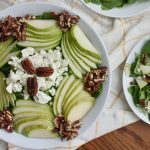 Made with sliced pears, toasted pecans, and Boursin cheese, this salad’s delicious combination creamy, crunchy, and sweet are why there are never leftovers. It is that good! Homemade creamy faux caesar salad dressing. This recipe is not an advertisement for Boursin cheese, we just really like it in this salad. 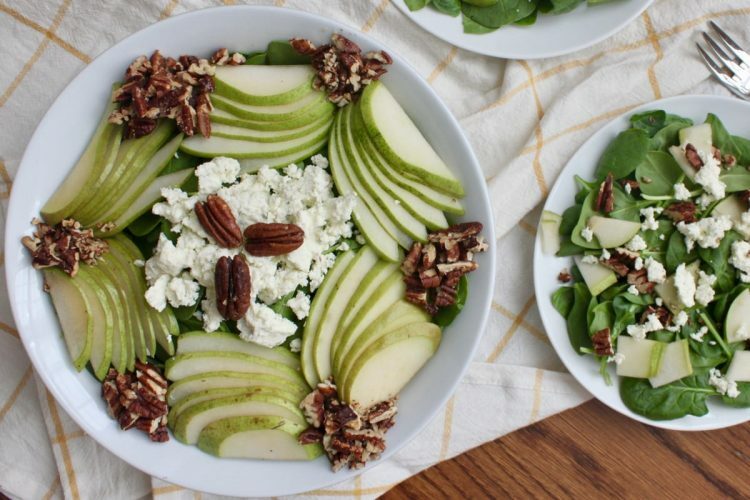 Creamy and crunchy, this spinach, pear and toasted pecan salad with Boursin cheese is delicious enough for a special meal and quick enough for any weeknight. *Note: Spinach and pears consistently test positive for pesticide residues, including organophosphate pesticides. That is why I choose to buy organic or pesticide free versions at my grocery store. Read more about pesticides and produce. This spinach and pear salad can be served deconstructed with the ingredients separated for picky eaters (like my 3 year old). Research conducted at the Cornell Food and Brand Lab has shown that children have different preferences than adults for how food is served. And when children like how food is presented, they are more likely to eat and enjoy it. Read full article on plating food for kids: why deconstructed meals work. I don’t use Boursin cheese often enough! I can see how it would pair beautifully with the pear and pecans! Can’t wait to make it! Thanks Christina – I hope you enjoy it! Pears are one of my favorite fruits and I really like them in salads. I love all the components. Thanks Jere – I agree, pears are delicious in almost everything! It’s like you took a bunch of my favourites things and turned it into one dish – love it! Thanks Sarah – I hope you enjoy the salad. It is definitely one of my favorites! Looks like a healthy, winning salad with the spring and summer seasons ahead! Love Boursin cheese too 🙂 Thanks for the recipe inspiration! Your are welcome Traci! 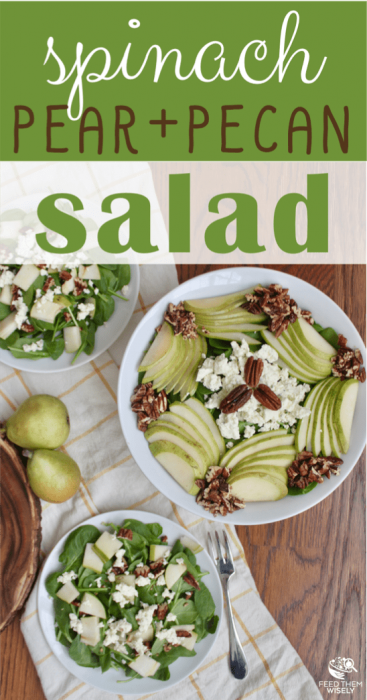 This salad is definitely great for warmer days! Boursin cheese is soooo yummy! This salad looks great! The ingredients in this salad are perfect! I am a huge fan Boursin and so is my family! Definitely giving this a try! Your salad looks so yummy. Can I say I’ve never heard of Boursin cheese? Loving the flavors of this salad and your pics are so good! Thanks Jessica! Boursin is one of our favorite soft cheeses… great for parties and a simple snack with crackers (not an ad – just a family favorite!). However, a mild goat cheese will also work well in this salad! Such a great combo. 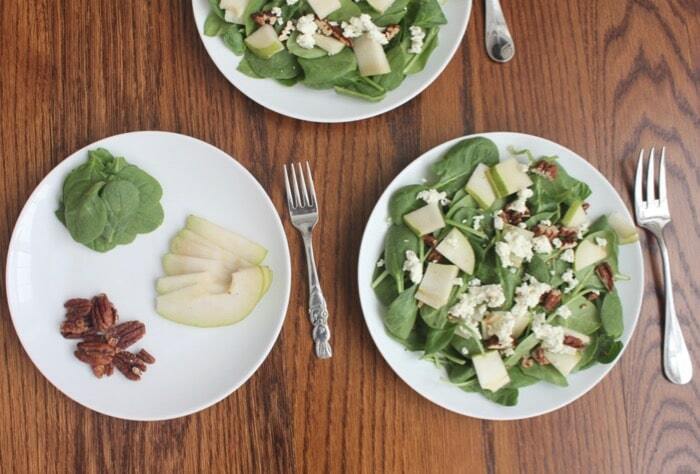 I love pear and spinach salads. Perfect!